Lahiru Gamage took a hat-trick as part of career-best figures of 5 for 33 as Sri Lanka A cruised to an eight-wicket victory against Durham. Danushka Gunathilaka, the opening batsman, struck his second fifty of the tour as the visitors cantered home with more than eight overs to spare. The match threatened to be over much early when Durham slipped to 46 for 5 in the 11th over after being put into bat with Gamage claiming his three-in-three. His victims were Michael Richardson, caught behind, then he trapped Ryan Pringle and Gordon Muchall lbw. 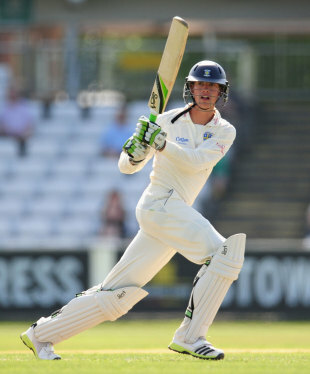 However, Durham managed to bring some respectability to the total Keaton Jennings made 65 and Gareth Breese hit 51. The pair added 91 for the seventh wicket after Stuart Poynton, on his first-team debut, began the fightback with 36 in a sixth-wicket stand 54 with Jennings. But just when the home side may have hoped to post something around 250, the last four wickets fell for five runs. Chaturanga de Silva, the left-arm spinner, chipped in with 3 for 19. Sri Lanka A's opening partnership took them more than halfway towards the target as Gunathilaka and Mahela Udawatte, who was dropped at slip by Scott Borthwick early on, added 100 in 23 overs. Breese broke the stand when he bowled Udawatte for 50. Graham Onions, who is continuing to feel his way back into action after injury, bowled his full 10 overs and removed Niroshan Dickwella but the final 47 runs were knocked off in eight more overs.